We are a boutique game consultancy based in Fremantle, Western Australia, focused on helping you do what you do better through the power of games and play. We specialise in serving ethical businesses, social enterprise, government, non-profits, charities and educators. We are uniquely positioned in this space. We bring together nearly 30 industry experience, including game design, teaching and research with long history of working with non-profits, government and educational institutions in both Canada and Australia, including the Western Australian Department of Transport, Curtin University, Health Canada, Department of Canadian Heritage, and the Office of the Privacy Commissioner of Canada. We’re also changemakers ourselves and believe strongly in “being the change” by living our values. For example, in everything we do we strive to do it in the most sustainable, healthy and environmentally friendly manner, such as using upcycled/recycled materials in our games or serving organic wholefoods at our workshops. Create customised games using a variety of platforms and technologies, depending on what suits your project best. 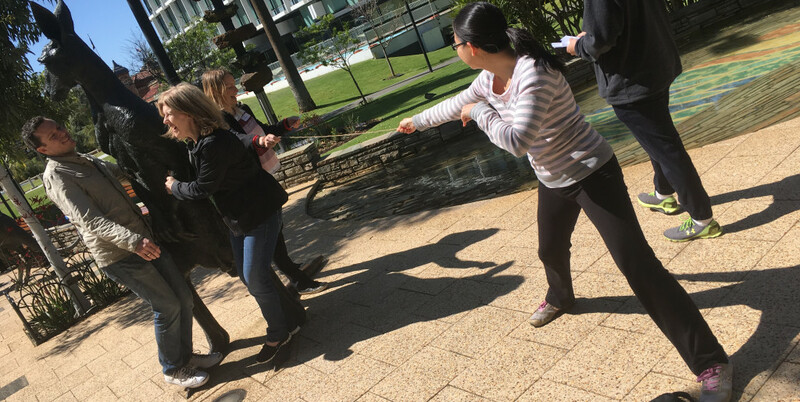 We specialise in games for a variety of educational or pro-social outcomes, such as public outreach, training, wellness, community engagement and space activation. Improve your games or projects currently in development using focus groups and playtesting. 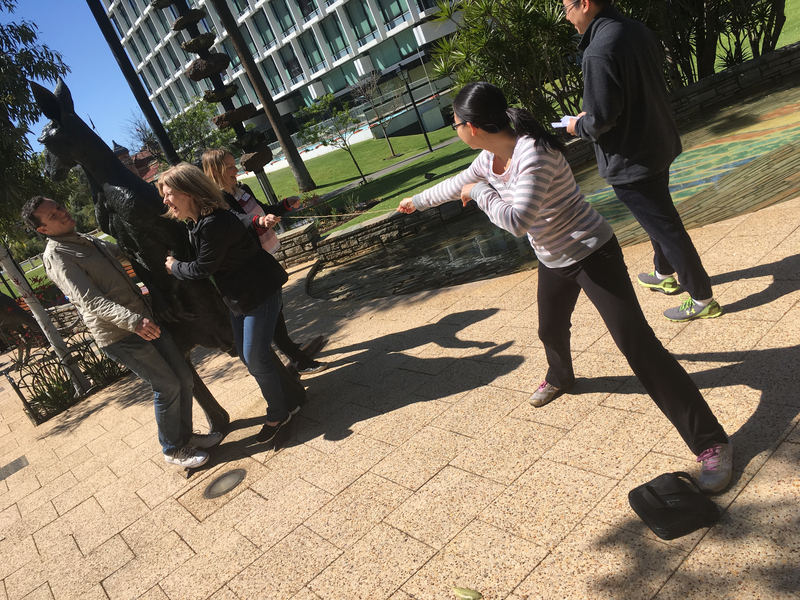 Deliver customised game workshops to upskill your staff or effectively engage with new audiences, such as students and younger people. Our core team consists of Dr. Kate Raynes-Goldie and David Fono, who have been creating games and playful culture events together since 2007 as Atmosphere Industries, a non-profit games organisation that creates people and public space-focused games which have been showcased around the world, including Perth’s first pervasive/alternate reality game, Ghost Town. To suit the needs of each project, we work with a variety of developers, artists, writers, game designers, actors, and technologists. Kate is an award-winning game and interactive designer/producer, community activator and professional educator with over 12 years experience. Kate was recently honoured as the WAITTA Incite Achiever of the Year and was named one of the top 75 most influential women in the games industry in Australia and New Zealand by MCV magazine for the past two years running, who also recently profiled her. Kate has created a wide variety of games and playful experiences that have been featured around the world, including IndieCade (San Francisco), Come Out and Play (New York), the National Theatre (London) Playpublik (Berlin) and Fresh Air (Melbourne). In 2012, Kate created Playup Perth, Western Australia’s first playtesting forum for new and experimental games, which she runs in partnership with FTI. Kate’s been invited to speak and share her work at top international industry events, including SXSW, The Freeplay Festival and TEDxPerth and has been featured on MTV (twice! ), the ABC and in ELLE magazine. 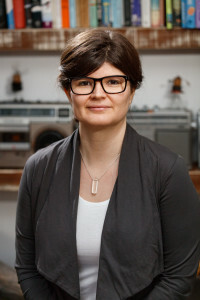 Kate is a graduate of the CFC Media Lab Interactive Art and Entertainment Program (Canada) and holds a PhD from Curtin University (Australia), where she is also an Adjunct Research Fellow. Kate is a Professional Member of the Institute for Learning Professionals and a Certified Living Smart Facilitator. David is an award-winning interactive designer and developer with 17 years of experience, and is proficient across a wide range of media and technologies. 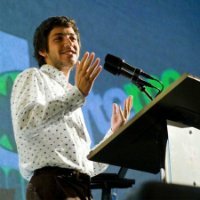 He has made several dozen games across all manner of media, including Flash games, iPhone games, board games, street games, and alternate reality games. Some of these games have been featured internationally at Indiecade (San Francisco), Gamercamp (Toronto), Come Out and Play (New York), Playpublik (Berlin), London’s National Theatre, and Berlin’s HAU. His work on the alternate reality game ZED.TO won the 2012 Canadian Digi Award for Best Cross-Platform Fiction. Plus, he co-organizes Board Game Jam, an annual event in Toronto. David holds an MSc in Human-Computer Interaction from the University of Toronto (Canada).